This interesting styled garden wall clock makes a creative feature for your house and or gardens. 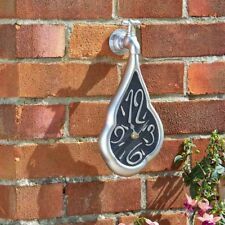 The dripping clock is positioned under a typical tap design. The clock requires one AA battery (not included) and is weather resistant. It will make an interesting statement in the garden or around the home with its intricate design. * Outdoors or indoors * Artistic design * Quartz accuracy * Hand painted design * Weather resistant Size 12". Alarm, and RCC signal indicators. 12 hour format with PM indicator. Large LCD Display. Five minutes repeating snooze. 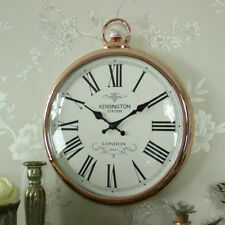 A large round wall clock in a copper colour with fob detail on the top. I personally take the most pleasure in sourcing and adding new lines to this website. At Windsor Browne, we hope you will agree we have lots of beautiful things! An elegant design with a contemporary aesthetic, this Karlsson Charm Pendulum Grey Steel Wall Clock features gold baton hands and raised markers, which make a striking contrast with the sophisticated grey dial. A black glass and beech wood contemporary pendulum clock from Wm Widdop. Pendulum Wall Clock Beech Sides with Black Dial. The clock has a minimal silver arabic dial featuring only the 12 and 6, with slimline hands. SILENT SWEEP SECOND HAND. BLACK HANDS. LIGHT BRONZE AND SILVER SURROUND. 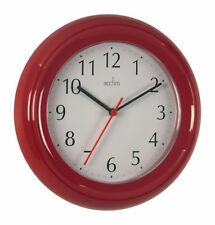 OVAL "SEIKO" WALL CLOCK. 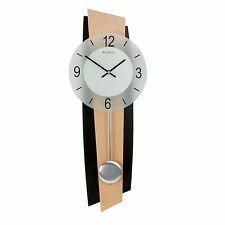 MODERN BLACK & BEECH WOOD WALL CLOCK WITH PENDULUM. NEW AND BOXED. THE CLOCK HAS A WORKING PENDULUM. THE CLOCK HAS BEECH WOOD AND BLACK BACK PANEL. ULTRA MODERN BLACK & BEECH WOOD WALL CLOCK WITH PENDULUM. NEW AND BOXED. THE CLOCK HAS A WORKING PENDULUM. THE CLOCK HAS BEECH WOOD UPRIGHT SIDE PILLARS WITH A GLASS BLACK CENTRAL PANEL. THE CLOCK HAS A WORKING PENDULUM. THE CLOCK HAS WOOD CURVED SIDE PANELS AT THE BACK,ONE IN A WOOD FINISH AND THE OTHER PAINTED SILVER. One way rotating Pendulum. Plastic Case. Argos will then notify you when your order is ready for collection. At night, when there's little solar energy around, they utilise battery power. A standard clock may last one year on double A batteries. Using solar power, the batteries will last between four and five years. Zippo Lighters. Seiko Musical wall clock. Demonstration button. Official Seiko Agents we have a large range. Also:- Amazing grace, The planets "Jupiter", Waltz of the flowers, Salut d'amour, Pictures at an exhibition, Dance of the reed pipes. Zippo Lighters. Demonstration button. Amazing Grace. Pink Marble Case. RRP £165.00 Our Price £131.95. Our Products. One-way rotating pendulum. Joy to the world, Silent night, Jingle bells. One-way rotating pendulum. Demonstration button. Amazing Grace. Condition is Very Good used. Silver coloured finish with see through i nner side panels. 14 colourful sparkling LED lights 12 hi-fi melodies Volume control Demonstration button Light sensor One way rotating pendulum Batteries: D x 4 Dimensions: 52.8 x 38.9 x 11.9cm . If there's a problem, just let us know and we will fix it. Eternity Rings. This wooden cased wall clock splits into 3, revealing 5 rotating bells with flashing lights and Swarovski crystal detail. - Alarm Clocks. - Kilimanjaro Collection. - Miniature Clocks. 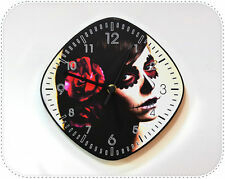 ❂ The clock on the first picture is made of black mat acrylic 3 mm thick, with high quality printed vinyl sticker. ❂ The clock on the second and third picture is made of black and white matte 3 mm thick acrylic. Pink Marble Case Hourly strike Volumne Control Dimensions:41.6 x 38.5 x 7.6cm Batteries: C x 2, AA x 3 On the hour it plays a melody (18 Hi-Fi melodies incl Christmas/Westminster) Light sensor disengages all melodies when it becomes dark Demonstration button One-way rotating pendulum Made with Swarovski® crystals . PART NUMBER: QXM376B. Part Number QXM376B. One way rotating pendulum. Case Colour:Brown. Dial Colour:Brown. Interested in becoming a vendor?. Widdop Sleek-Black Glass Dial Pendulum Wall Clock. Sleek and Stylish Widdop Wall Clock. Black Glass Arabic Dial. Glo Goodies is a division of J.C. Household Ltd. We would love to hear your thoughts on our products. New STOLPA Clock. Clock Yellow STOLPA. In order to save energy, the watch has a UV sensor that senses the brightness of the room, so the lighting around the watch face lights up only when it is dark. Clock STOLPA. To save energy, the clock has a UV sensor that senses the brightness in the room, so the lights around the clock face only shine when it’s dark. In a bright room the light will turn on, and in a dark room it will shine brighter. Made by: Seiko. Demonstration button. Scottish Highlands & Islands and Isle of Man. Northern Ireland, Channel Isles. Non-Ticking/Silent Sweep. Clock's shape: Oval. High quality Standard Wall Clock. Clock's size: 40 x 30 cm. Perfect for: Bedroom. Battery Backup. Features: 12 Hour Display. Living Room. Quartz Oval Wall Clock Modern design suitable for the home or office Size approx W32cm x D6cm x H7cm Requires 1 x AA Battery (Not included) . Zippo Lighters. RRP £445.00 Our Price £333.75. Demonstration button. Amazing Grace. Our Products. One-way rotating pendulum. Designed to look like a stylish wrist watch, the chic look of the wall clock will make a fantastic and functional feature on your wall. 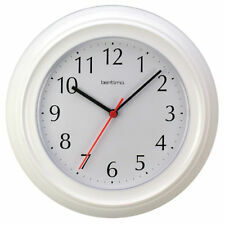 The chic clock is ideal for your bedroom or living area making a striking feature on your wall. Eternity Rings. Cufflinks, Tie Tacks & Slide. - Alarm Clocks. Alarm Clocks. 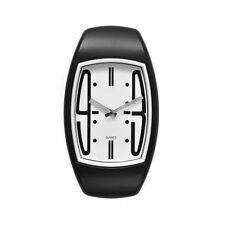 - Watch Gift Sets. Watch Gift Sets. - Gold and Silver Jewellery. How long will my order take to arrive?. One way rotating pendulum. Made by: Seiko. Case Colour: Brown. Dial Colour: Brown. Display Type: Analogue. Case Material: Wood - Rubber. Battery Type: C (ALKALINE) X 4. Seiko wall clock with sweep second hand. Quartz movement. Size H45.4, W18.5, D4.9cm. Batteries required 1 x AA (included) . Silver Oval Wall Clock. Stylish Stop Watch Design. Height: 33 cm. Made by: Seiko. Demonstration button. Scottish Highlands & Islands and Isle of Man. Uber modern design wall clock. RTS @ HARTS. One way rotating Pendulum. Made by: Seiko. Plastic Case. One-way rotating pendulum. Demonstration button. AMS 7416 Wall-Clock - Series: AMS Wall Clocks. We are looking forward to your order! London Clock. We are looking forward to your order! Blomus Uhren. 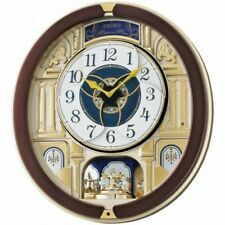 Wall Clock Home - beautiful room decoration. Made from MDF. Very decorative. The movement is modern and battery operated (batteries not included). Dimensions: Ellipse -Wide about 49 cm. Height: 39 cm..
Each Clock is unique and the Concrete or Wood grain and color tone might vary slightly. ❂ PLY Oak Wood 0.16” - 4 mm / Varnish With Dark Oak Satin. ❂ The clock is made of two layers, one Concrete and one Wood. Each Clock is unique and the Concrete or Wood grain and color tone might vary slightly. ❂ PLY Oak Wood 0.16” - 4 mm / Varnish With Dark Oak Satin. The clock is made of two layers, one Concrete and one Wood.